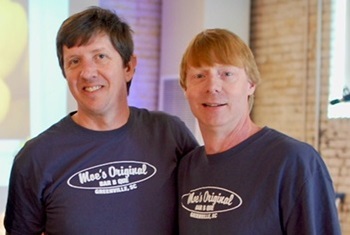 Moe’s Original Bar B Que, winners of the People’s Choice Award at the Taste of the Upstate, will open its southern soul food revival in Greenville in late June at 109 West Stone Avenue in the Westone Development. Serving lunch and dinner daily, the 2,500-square-foot, fast casual establishment will offer Alabama-style BBQ, traditional southern sides and desserts prepared fresh daily. With the ability to seat 94 total at booths, tables, and high tops including 36 on the patio, the BBQ joint will have flat screen televisions hanging on the walls, a full bar with rotating taps and frozen bushwackers, and garage doors open to a patio complete with outdoor fire pit. The neighborhood restaurant will also provide full service catering for celebrations and corporate events as well as large party takeout orders. Recognized with many awards, Moe’s Original Bar B Que has been named one of the fastest growing, emerging restaurant chains by Restaurant Business Magazine, one of the Top 10 Rib Joints in the U.S. by Relish and Top 10 BBQ Chains in America by USA Today and The Daily Meal. Moe’s Original Bar B Que features pulled pork, ribs, wings, turkey and chicken smoked over hardwood served along with catfish and a shrimp sandwich. Additionally, a daily rotation of traditional sides and house-made desserts are prepared from recipes passed down for generations. Since 2001, Moe’s Original Bar B Que has grown from a junkyard pit to over 60 successful restaurants in 16 states and Mexico.